October 20 The first flight from the U.S. to Alaska was made by four D.H.4Bs under the command of Capt. St. Clair Streett. The flight departed Mitchel Field, Long Island, N.Y. on July 15, 1920 and arrived at Nome, Alaska on August 24. 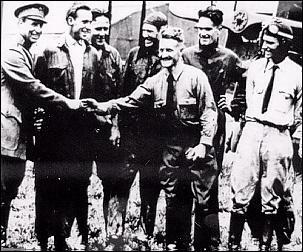 The same planes and crews returned to Mitchel field on October 20, thus completing a round trip of 9,000 miles. A large part of the flight route was over uncharted mountain peaks, isolated glaciers, and dreary swamps. By 1920 standards, this was a remarkable achievement, particularly when considering the almost complete lack of navigational instruments of the period. For this flight, Streett was awarded the Mackay Trophy for 1920.